Vegetarian and vegan friends in Barcelona!!! I know it is quite difficult for you to find a place to eat properly in jamon-loving spain. Therefore I am even happier to introduce you.... JUICY JONES - a vegan and vegetarian restaurant in Barcelona!!! In Juicy Jones you get really good, tasty and healthy food without any animal products. To be honest: I am not vegan, not even vegetarian.. but I do love this restaurant. A vegan friend invited me one day to go there and try it..I was deeply surprised how good and tasty vegan food can be. They also offer really good fruit juices, smoothies and shakes - delicioso drinks, which give you an energy boost. You can enjoy the Menu del Dia, which gives you a choice of appetizer, main course, dessert, and beverage, for a very reasonable price of 8,50 €. You should definitely try the "Thali" there, one of the best I have ever had. Juicy Jones has a really funky, kind of "Gaudi-esque" design inside, which seems a bit psychedelic. Basically the walls are as bright and colorful as a nicely filled fruitbowl. So sometimes it might be a bit difficult to concentrate on the menu without getting distracted by the design of the restaurant. The staff is really friendly and you feel very welcome there. WOK – the best open buffet in Barcelona! To talk about La Taguara, an amazing restaurant located in Born, Barcelona, first of all we have to explain what is the meaning of “Arepa”: According with the Wikipedia definition, an arepa is a dish made of ground corn dough or cooked flour, popular in Venezuela and other Spanish-speaking countries. But, if we take the definition from the point of view of those who have tried, we could say that is a fantastic, healthy and unique dish. La Taguara is a Venezuelan restaurant specialized in arepas with all kinds of ingredients such as chicken, tuna, meat, cheese, avocado etc. The place is really cozy although you have to eat standing. The atmosphere is really cool with good music, colorful mask and typical Venezuelan decoration. Our favorites dishes in La Taguara are “La pelúa” (meat and cheese), “reina pepeada”(chicken and avocado, “sifrina” (chicken, yellow cheese and avocado) y la “Catira”(Chicken and yellow cheese). "Shh... do not say it to anyone" is a place in Gracia, Barcelona where you may leave the rush and give some time to yourself in a good atmosphere. Enjoy a great and friendly service, good food, special cocktails and much pampering. In this cousy place you will find awesome varieties of quiches, some vegetarian options, cooking fusion dishes and the well-known Spanish tapas and patatas bravas, Home Specialties. Also you will ask for the house brownie, holly god!! It is amazing… but… do not say it to anyone. Restaurant has ethnic-decorated with old style wooden furniture, candles, pop-rock music and special details that will make you feel like home. Sunday is a special day, live music, flamenco dancers and cinema (different movies). Try the best pizzas in town! Today I am NOT going to introduce you to another Tapas restaurant out of the countless ones we have in Barcelona, neither to a Paella restaurant.. no! Today I want to present you one my personal favorites (and of a lot other people here) in Barcelona: LECHUGA superpizzas! Lechuga is located in Carrer dels Escudellers, right in front of the popular “Los Caracoles” restaurant. You can easily get there from Plaza Reial or Las Ramblas. I don’t know how often I said that since I am living here in Barcelona. All the pizzas in Lechuga are made with best ingredients and fresh out of the oven! The guys in Lechuga have created awesome toppings, like: bacon and barbecue sauce or goat cheese with honey.. and lately they also had pizza with salmon. Besides that you can get pizza with rocket, pesto, chorizo, different kinds of cheese, spinach, pesto, ham, tuna and so on. They also always have pizzas for vegetarians..with artichokes, courgettes, sweet corn, pepper, mushrooms etc. They also provide bottles with extra barbecue sauce, honey, Tabasco sauce, spicy oil and oil with herbs if you want to pimp your pizza a bit or can’t get enough of the barbecue sauce (like me). The pizza slices are pretty big there and you get one for 2 €. A can of beer, coke etc. or a water is just 1 €. The guys there are really nice and in Lechuga you can really see everybody grabbing a slice of pizza there – from business men in suits to skaterboys. By the way..Escudellers is in general a really cool street off of the Ramblas with a lot of nice bars there (f.e.” Ryans” and the “Tequila Bar” with headphones everywhere). At the end of the street you will find the famous Plaza de George Orwell. Outdoor dining, with stunning views over the old port of Barcelona El Chipiron, worth visiting already just because of its fantastic location. 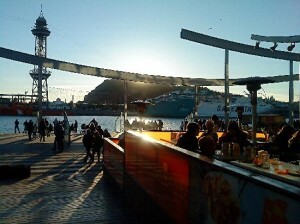 This restaurant is located near shopping centre Maremagnum at the port of Barcelona and looks straight out on the water. Especially when the lights are on at night is this exceptionally beautiful. It is possible to sit inside and enjoy the view, but the real enthusiast will still take a seat outside. You don´t have to be afraid of the cold because the tables are equipped with heating stoves, which also adds to the atmosphere. The restaurant is well known for its seafood, which they prepared very professionally, so it is not a big surprise that there is an rich assortment of seafood and paella to be found on the menu. It is also possible, if you want to relive the moment, to take food home with you from the restaurant. You don’t have to worry if you are not a real fish enthusiast, Chipiron also offers great half chickens or steaks with potatoes. Definitely something worth trying! The service itself is friendly and helpful. Outside you'll get a warm welcome and you will be guided to a table, you don't even have to have a reservation. You don't speak Spanish? No problem! It might take a little bit longer, but the staff will try their best to give you the best service possible. 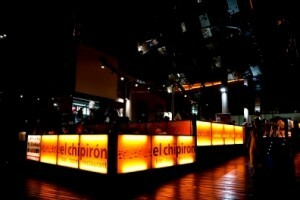 Sunny terraces by the sea, private rooms and cozy corners, make El Chipiron a great place to relax and enjoy great food.